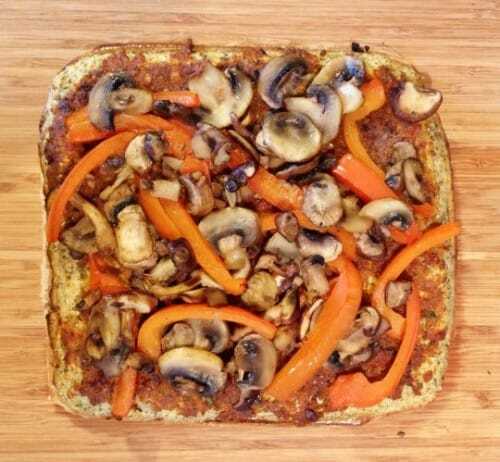 Recently, I posted an Instagram picture of a gluten free pizza crust that I had made using cauliflower, and oh my, it got a good response! I mean, let’s face it, pizza crust is one of those things that us GF folk really get the short end of the stick on, so I’m not surprised about the excitement! This recipe also sparked some excitement among the paleo friends/readers I have as it’s completely paleo. Also, did I mention there’s no dairy in it? 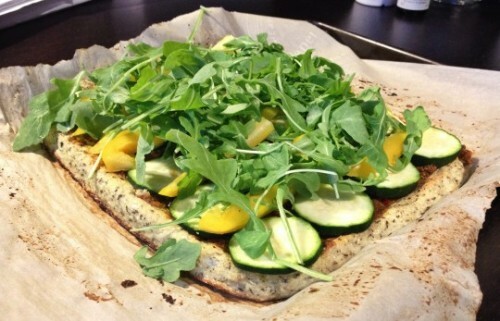 The crust of the pizza is inspired by Green Kitchen Stories. 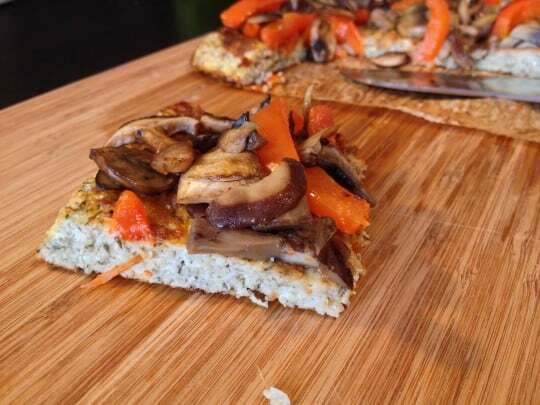 The fun part about this recipe is you can really change the toppings to whatever you want! The first time I made it I did zucchini, bell peppers and arugula as the topping, and today I did mushrooms and bell peppers. Both times I used a store-bought pesto (Le Grand) as I didn’t have time to make sauce from scratch. -You may need to drain the cauliflower (it holds a lot of water, so you may need to try and squeeze as much out as possible). The second time I made the recipe, I didn’t have to do this because the cauliflower mash had been in the fridge for two days, so had dried out on its own. -I wouldn’t use a super liquidy (yes, I know this isn’t a word) topping as it may make the crust too moist. I used a pesto, so it wasn’t soggy.